Lots of short festive activities, jokes and video clips - all with a science theme. Perfect to use to round off a lesson or in tutor time in the run up to Christmas. Many thanks for your comments, the resource has now been tweaked and should cover every day for term time. Unfortunately it just doesn't download! seems like some errors with the dates and links....2 slides say 3nd december! Great resource, but think there there is a mistake with the dates, surely we are at school on 2nd 9th & 16th December, but the sprouts slide implies we are not. I cant open the document as it tells me their is a problem with it & when I click repair it tells me there was an error accessing it! Hi Claire, very pleased to hear that you like the resource. We're sorry that some of the links are not working properly for you, if it's the links within the PowerPoint (e.g. that take you back to the start page) it may be the version of PowerPoint that it has been opened in. I've checked with our tech team and the links should work in versions 2010 and earlier. Not all of the links are working for me at the moment. However, I do like the idea and will try to find the time to sort them out. 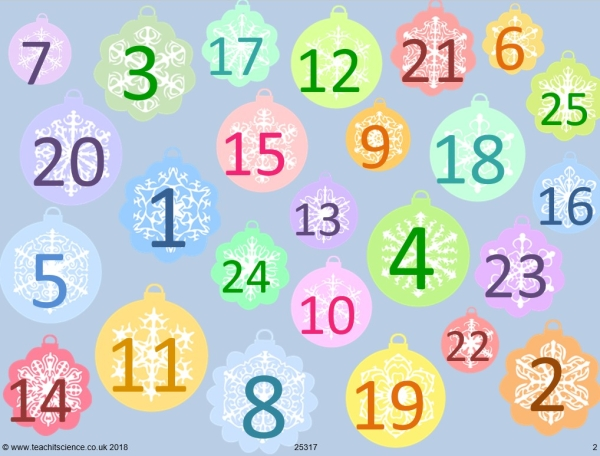 Thanks for this free resource to add a little festive fun!